I was in attendance for a personal project of my own, a feature length screenplay I wrote on a whim and submitted to the festival’s screenplay competition on an even whimmier whim. But more on that later. 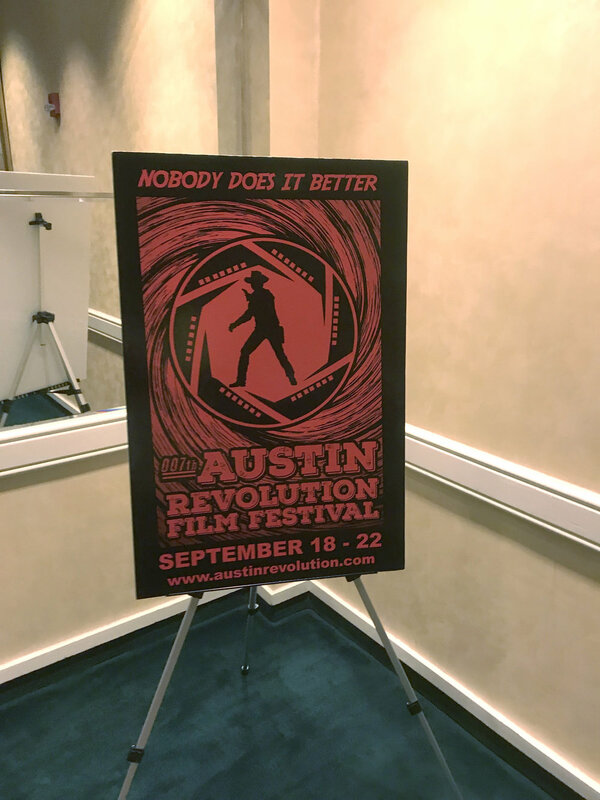 The Austin Revolution Film Festival has earned a reputation as one of America’s top independent film competitions. It’s obviously overshadowed by its bigger and better-known local cousins – SXSW and the Austin Film Festival – but it has managed to carve out a niche as a great place for rogue filmmakers and screenwriters to share their stories with like-minded lovers of independent cinema. Over the course of two and a half days, there was a lot of networking, bonding, and information sharing, all of which I found both helpful and inspiring for a screenwriting newbie like myself. But the bulk of each day (and night) was spent in dark screening rooms, watching film after film of various lengths and genres. I saw the beloved pooch of single woman turn into a man – and then become her lover. I saw a candy company’s sales call to a supermarket turn into a bloodbath. I saw suburban teenagers protect and then adopt a Baby Frankenstein. I saw four unassuming County Cork residents try to pull off a heist, only to be foiled by the local nuns. How’d they come up with that? It was an amazing experience for someone like me – someone who lives to see fresh, new ideas connect with people. And it becomes all the more amazing when you stop to think that the people who made these films made them for one simple reason: They had a story to tell – a story no one else was telling. And even as a hardened, cynical adman, I can think of no more noble pursuit in life. As for my story? It’s a feature-length screenplay called “Hundo.” It’s about three young friends who find a hundred dollar bill and think they’ve hit the jackpot. Only problem is, the hundo belongs to a local drug dealer who really, really, really wants it back. If I were pitching it to Hollywood types, I’d probably describe it as “Stand by Me” meets Quentin Tarantino. I may be biased, but I think it’s a pretty good story. And the judges for the Austin Revolution Film Festival must have agreed. They selected “Hundo” as a finalist in their 2018 Screenplay Competition, then awarded it the Runner-Up nod in the Action Feature category. I would have loved to come home with a trophy, but I can’t help but feel like a winner anyway. After all, it was the first screenplay I ever wrote, and the first film festival I ever entered. But you know what makes me even happier? The thought that every judge who read “Hundo” during the competition probably asked themselves the same question: How’d he come up with that?